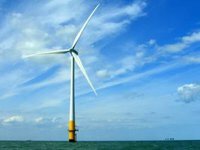 Touchstone Capital Group (the U.K.) is interested in a project to build an offshore combined solar and wind power plant in Ukraine, the press service of Ukraine's Energy and Coal Industry Ministry has reported after a meeting of profile specialists of the ministry with a delegation of the company. "At the meeting, representatives of the company presented a project for the offshore combined solar and wind power plant with a gigawatt power capacity, which is unique not only for Ukraine, but also for the nearest neighboring countries. Its additional advantage is the availability of its own balancing capacities, which will ensure a more even schedule of electricity production. The project also envisages the use of a significant (more than 30%) share of components of Ukrainian production," the ministry said in a statement. The ministry said that it is important that the implementation of these large projects occur in accordance with the actual state and the plan for the development of the electricity transmission system, and does not lead to deterioration in the operational security of the country's power grid. In turn, representatives of Ukrenergo at the meeting reminded: 70-80% of the projects for the construction of "green generation" is being implemented in the southern region of Ukraine (Zaporizhia, Kherson, Mykolaiv and Odesa regions), which is energy-efficient and simultaneously lacks maneuvering capacities. Touchstone Capital Group is engaged in property management, development of projects in the field of renewable energy. The group operates funds from Chinese and other international investors.